Today is the 100th day that Brendan Bjorn has been bedridden with the pressure sore which has drastically changed our lives the past 12 months. It is the 3rd time it has opened, and it is the longest time period of it remaining open. 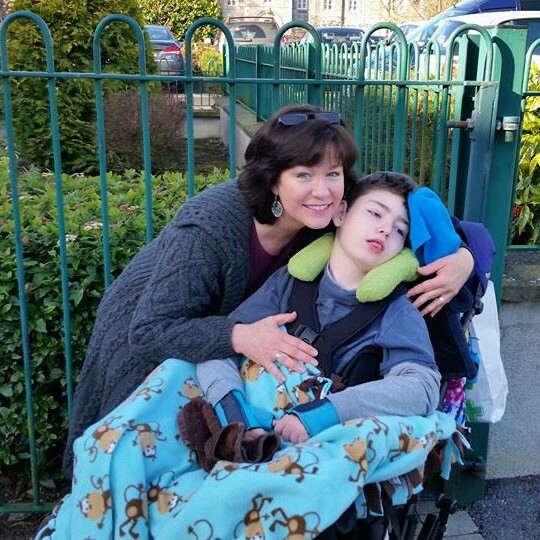 In those 100 days, he has only been out of his bed and into his wheelchair for transporting to and from overnight respite on occasion and for 2 trips back and forth from Kildare to Louth for our move. Those seldom trips have worsened the pressure sore each time. Yes, I feel guilt over that and am now considering cancelling the 2 nights respite coming up next week because of it. I need the break, especially considering all I have left to do regarding settling into our new rental home. Am I going to be putting my precious son at more risk for prolonged time being bedridden? The self-talk of a carer…a carer in crisis, as we hashtag on Twitter. Two days ago, I gave Brendan Bjorn a shower in the loaner shower trolley which had just arrived. He was far more comfortable in the trolley compared to the old, unfit, unsafe shower chair we have had for years now. However…as the rolling floor hoist cannot be used to bring him from his bedroom into the wet room, it is again – STILL – me who must carry him in my arms from one room to the next. Then, back again after the shower. The hoist is useless in this house and remains idle, sitting in the kitchen as I type this, and is only in my way. While the shower trolley is a vast improvement for showering, the situation is still not safe for either of us as I carry him precariously in my arms. So, I dream of a ceiling hoist from bedroom to wet room…and a wet room large enough to accommodate such a dream. If I owned this house, those modifications could be made. But alas, I am merely renting, subject to the insecurity of a lease and restricted on what I cannot do to make this a fully suitable home for my disabled son. I actually really like this character-filled house that is over 100 years old. And on this 100th day of my son being bedridden, I wish it was the previous 100 that I was celebrating as mine, not the latter 100 which I am writing about with heartache that is mine. Ireland, the 8th amendment, and me.